How important is intentionally in awarding a penalty? This may well be a case of unintentionally? With eight minutes to play, he Stormers have the ball and are going left. Scrumhalf Justin Phillips passes to Chris van Zyl (5). Van Zyl has Scarra Ntubeni (16) close on his left as he charges forward. 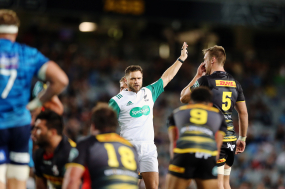 But then, you have a player penalised when falling back k to his side at a ruck and the opposing scrumhalf intentionally throws the ball at him in order to get a penalty - and such a penalty could become a match-winner. If a referee is expected to judge an intentional act, could he not be expected to judge and unintentional one - as in this case.